No matter what device you’re using to access a database, FileMaker wants the finished product to look good. And so the latest update to the software maker’s flagship database product puts an emphasis on design features regardless of which platform you’re using. The new FileMaker 12 lineup unveiled Wednesday updates the company’s Mac and Windows database offerings while introducing new free apps for the iPhone and iPad. Chief among the changes are additions specifically aimed at helping FileMaker users build eye-catching databases that move seamlessly from desktop to mobile device. 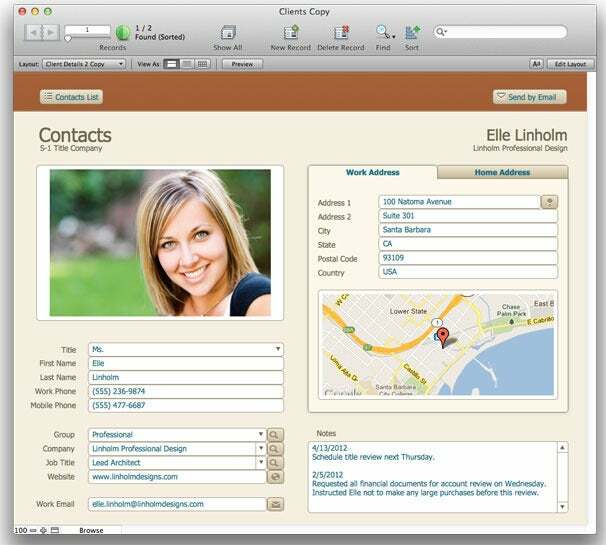 “People want databases that look good, work well, and are really well-organized,” Ryan Rosenberg, FileMaker’s vice president of marketing and services, told Macworld. To that end, FileMaker Pro 12 offers 40 themes for giving your databases a distinctive look. Depending on which theme you select, you can change a database’s color, button appearance, text format, and borders. More important, the new version of FileMaker includes what the company bills as “touch” themes, which are optimized for mobile use on the iPhone and iPad. Those themes can be customized with new design tools, FileMaker says. Users can add gradients to layout objects, for example, or enable buttons to show different highlights when a mouse passes over them. Other design tools in FileMaker 12 include image slicing, dynamic alignment guides, and configurable grids. In addition to themes, the FileMaker 12 update includes 16 Starter Solutions, aimed at getting users up and running quickly with pre-built databases. The included solutions tackle common business tasks such as contact management, project tracking, and inventory logging. (In fact, FileMaker has pared down the number of Starter Solutions included in this release, dropping underused ones to concentrate on solutions with a business focus.) As with themes, FileMaker’s Starter Solutions come with ready-to-use screens built for iOS devices. The new themes architecture in FileMaker 12 brings with it a file format change—the first since 2004’s release of FileMaker Pro 7. If you want to use an old database in the new release, you’ll need to convert it to the new FileMaker 12 format: FileMaker Pro 12 can take care of those conversions. The ability to add charts was a major part of 2010’s FileMaker 11 update, and version 12 builds on that capability with a new Quick Charts feature. With Quick Charts, FileMaker promises you’ll be able to create a chart with just a few clicks. The update also introduces five new chart styles: bubble, scatter, positive/negative, stacked bar, and stacked column. The FileMaker 12 update isn’t focused solely on appearances, however; Rosenberg says the new version also looks to help users manage the explosion of documents and multimedia files. Enhanced container fields will lets users drag-and-drop those files, enabling them to store everything from photos, videos, music, and PDFs. The database software automatically manages and encrypts remotely store files, and thumbnails provide previews of high-resolution images. With FileMaker Server, media files will be able to stream to connected clients. The server-side versions of FileMaker—FileMaker Server and FileMaker Server Advance—also get a version 12 update. The server products now come in 64-bit versions and offer progressive backups that only back-up database changes for faster performance. FileMaker Server also promises an improved web publishing engine and faster WAN performance—that latter feature is aimed at helping remotely connected users, particularly those with iOS devices. Speaking of iOS, FileMaker is releasing two entirely new mobile apps to coincide with the version 12 update. FileMaker Go 12, available in separate iPhone and iPad versions, will be able to record audio and video directly into a database. The apps also include four-finger swipe support as well as support for video and music streaming via iOS’s AirPlay technology. Both FileMaker Go 12 for iPad and FileMaker Go 12 for iPhone are free downloads from the App Store. Previous versions of FileMaker Go costs $20 and $40, depending on whether you used the iPhone or iPad version. FileMaker is eliminating the price tag on its new iOS offerings to encourage version 12 users to try the mobile apps. The old versions of FileMaker Go will remain in the App Store for users who need to use the old FileMaker file format. On the Mac, the FileMaker 12 family runs on Snow Leopard and Lion. (FileMaker 12 is also Windows-compatible.) FileMaker Go 12 requires iOS 4.3 or later for both the iPhone and iPad. FileMaker Pro 12 costs $299; existing users can upgrade for $179. The Advanced version costs $499, with a $299 upgrade. FileMaker Server 12 costs $999 ($599 to upgrade), while the Server 12 Advanced offering goes for $2999 ($1799 to upgrade). All the FileMaker 12 products are now shipping, with the mobile versions slated to hit the App Store Wednesday. We have a full review of FileMaker Pro 12 elsewhere on Macworld.com. We’ve also reviewed FileMaker Go 12 for iOS. Updated at 12:20 p.m. PT to include links to the FileMaker reviews.